Sunshine Snowflake Lace & Braid ! Well, she achieved all that & more! A snowflake made with radiating beams of rings only! First time I set eyes on her Sunshine Snowflake, I was intrigued & by how she got all those rings lined up one after the other – vertically radiating from a circular formation – just like sunbeams !! They seemed to be connected in a circle at the center but were simultaneously unconnected when radiating outwards And no threads crossing between motifs ! She graciously shared the pattern on the forum & has given me free rein to share it too, along with pictures of her own project. Click on the caption under the snowflake picture for the pdf. Anchor Mercer Crochet Cotton size 20. Variegated Purple with white – 1208. Each vertical row starts with one ordinary R, followed by SRs, ending with a small SSSR. That’s it !!! I started off intending to make the snowflake. But having made 3 vertical rows or one repeat, it dawned on me that this would look great around the neck ! So I restarted, this time converting it into an edging for neck. To that purpose, I eased off on the peripheral gradient by adding another vertical row between the ones in the original pattern. ( 4 rings, 6 rings, 4 rings ) x 6. Because each vertical row is ‘separate’ & started afresh, there will be a lot of thread ends to hide. So it is a very good idea, & convenient, to learn SSSR. I swear by SSSRs now !!! Gone are the days when I had to tie a knot & sew/ weave in the tails !!! One can increase the length of each vertical row by adding as many SRs as desired ! If the joining picots in base ring of each vertical row are shifted, then one can get a longer, broader curve, rather than a short & deep one. However, for a choker or necklace, it is perfect ! Add a pearl or bead & it’s soiree time ! If one continues further to complete the circle, it could make a nice mini-doily too (sew on a piece of circular fabric for center). And since each ‘row’ is made separately, one can grow crazy with multi-colored sunbeams !! The diameter from periphery is 7½ inches approx. Make 2 half circles, alter the positions of vertical rows & sew on as a stylized Peter Pan collar !!! It was a surprisingly quick & thoroughly enjoyable tat & was then hand-sewn on to my newly stitched apron. I have not tacked down each and every ring, just at critical & strategic points, to hold it’s shape & alignment. Next step : Make the neck or shoulder straps in the form of braids. Not as easy as smooth sailing as it seemed …..
All I wanted was a simple Split Ring braid, keeping the stitch count in sync with the snowflake/border, and using the same thread. But as the braid progressed, the thread regressed !!! The tightly twisted thread kept unraveling &/or breaking. I was already half way into the braid when the problems began, so chugged along. Change of course was nevertheless required ! Made similar braids with solid purple and interwove them with the original variegated ones, to provide the necessary strength, stability and durability. Interweaving braids was on my to-learn list for a long time anyways. I followed Gina Brummet's tutorial on Woven Split Ring Cord-2 shuttles. The smallest ring in the braid, however, wouldn’t allow the larger rings to pass through. Hence, the weaving was done by placing the smallest ring of one braid over the largest ring of the other braid; for all other rings, the braids were passed through them. This gives a slightly irregular weaving because after 2 proper weaves, the 3rd rings (one small, one large) in both braids just lie juxtaposed, not passing through each other. But overall, a symmetry is maintained & barely discernible. Repeats of -- ( SR 6/6, SR 10/10 , SR 12/12 , SR 10/10 ) to required length. Interweave the 2 braids & sew tips to fabric of apron. To go round the neck, a single woven braid suffices. I made 2 woven braids & sewed them on either side as shoulder straps, joining to the belt behind. It can get really hot under the neck in these Indian summers, so this is more convenient. Since the braids did not cross at back, length of 25 inches sufficed for me. One can also opt for sewing the entire braid on to fabric straps, which are in turn attached to the main body of apron. The braid(s) can be sewn on along the edges of the entire apron. I wanted the focus to remain on the “neck-lace”, hence did not attach the braid to the sides. The woven braid can be used as a belt/apron string as well. Or how about a string of rings around the neck ?! I enjoyed tatting the braids to the extent that the variegated thread remained willing & gracious. The solid purple braids were extremely quick & silken smooth to tat. That is the difference a thread can make !! The weaving, though easy, was a bit tiresome. Without a shuttle in the hand, it just didn’t feel the same ;-) But I learned a new technique & that’s what matters. "The knot does not care how it is made"
"Every tatter does it different"
I am very grateful to Patty for sharing her lovely pattern, & to Gina, for her clear tutorial . The 2nd and final part of the Tiny Heart Poppy pattern. The first part of Flower (petals) pattern is here. We’ve completed the 3 red petals. Now to add ‘embellishments’ to bring it to life ;-) : the flower centre made of yellow & black, a couple of free-standing buds, a leaf sprig, & then the main stem. 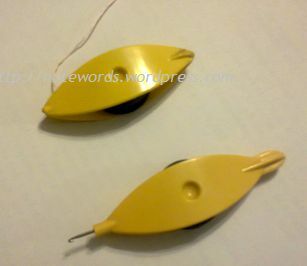 Wind yellow thread in one shuttle & black in 2nd shuttle/ball & tie together. No need to hide the tail ends as these will be required to provide stiffness to encapsulated stem later. Before starting JR2, try to turn JR1 at a 90° angle on Y axis. So instead of making a concentric, onion-ring type of overlap, we will get an overlap Across the 1st JR, vertically, at right angles. Hopefully the image & diagrammatic representation below, will give a clearer idea. Before closing, adjust this ring over the 1st JR so as to snug neatly over & around the latter. If required, add or subtract the half stitches. Since there is no picot in JR1 to which JR2 can be joined, one needs JR2 to fit snugly over, yet without distorting, JR1, Nor falling over itself ! I kept positioning the open ring stitches over JR1 till I felt the length was just right, then close JR2, keeping it positioned perpendicular to JR1. Place/position the yellow centre over the space between the 3 petals. (Pass the tail ends through this open centre, so that they are now Under the flower). Working from top, join to picot at the base of any petal, keeping the yellow JRs centred. Ch : ** ( 2FHS , p , 2 SHS , p ) …. Repeat ** for desired length, joining to the picots at the base of each petal at regular intervals. The chain should be long enough to go all around the yellow core. Lock join into place. I made the length slightly longer so that it overlapped a bit, before ending. If you look very carefully, this overlap of picots can be seen towards the right side in image. Overlap ensures that the black picots will never show any gap. Pass all the tails through the center, to the back of the flower, to be encapsulated later. 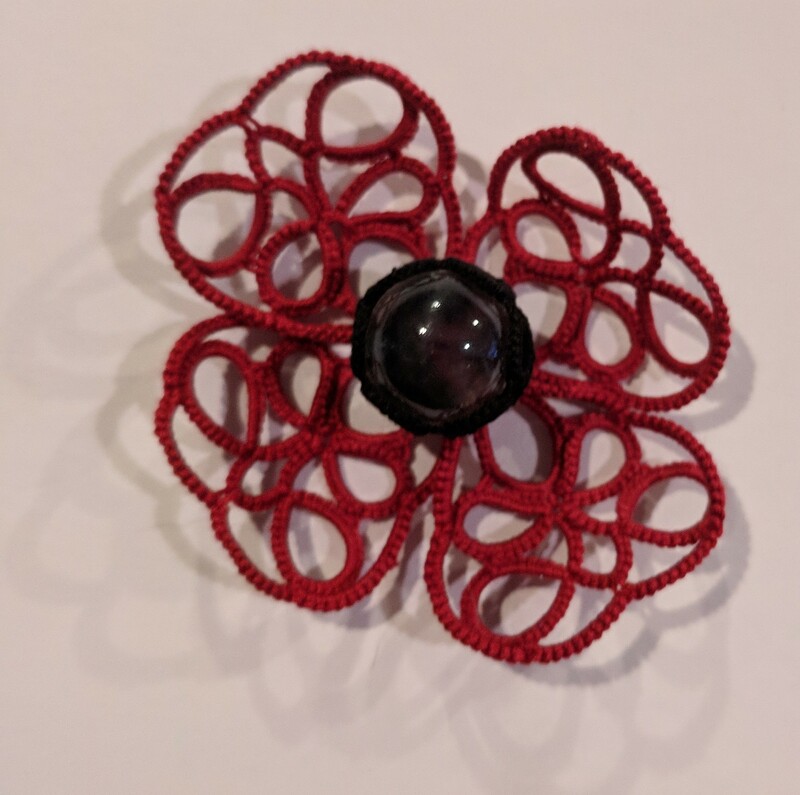 The Poppy Flower is now complete ! If one is looking for only a flower, one can stop here (hiding all tails). This can be sewn on to decorate or adorn headbands, bracelets, rakhi, gifts, etc. etc. Add a green calyx, if desired. I decided to add some stem, leaves, & buds to the flower to make it a stand-alone entity such as a nosegay (spritz your favourite perfume ;-) ), a lapel flower, brooch, or a boutonniere for men. Add a couple more flowers & paraphernalia to make a cute spray ! Wind an extra (auxiliary) piece of green thread along with the thread in shuttle, just enough for the 2 JRs. Make JR1 (15 half stitches) using this double thread, for added thickness. JR2 is made perpendicular to JR1. 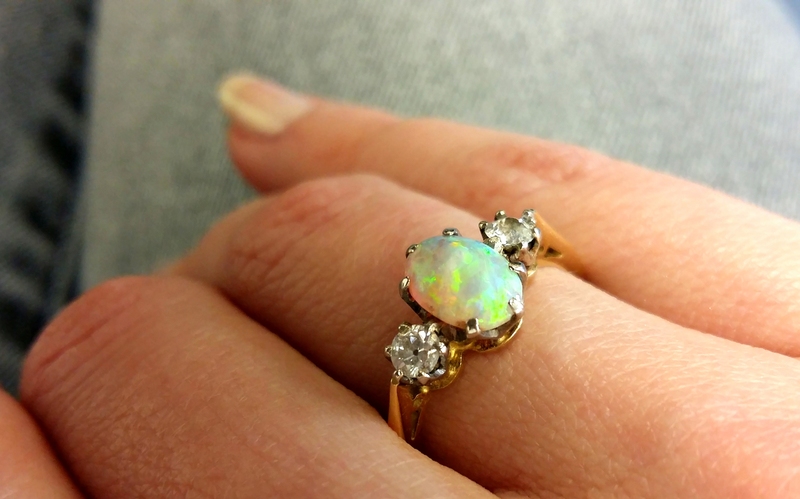 Before closing the ring, make sure it sits over the 1st ring just right, without falling over. Cut the extra length of auxiliary thread & hide it in the JC that follows, or keep it for encapsulation. JC for about 5½ cms (or as desired). Note : Since one is encapsulating, the half stitch of JC/spiral chain will remain unflipped. End JC with a small picot with which to join to main stem later. Do not cut. (This step can be skipped. After leaving a short tail, cut threads. Repeat from Step 1 for 2nd bud). JC going back up for 2nd bud. This stem is shorter ~ 4 cms long. Unwind shuttle & double up the remaining thread (or wind another auxiliary thread). Use this doubled thread to make the 2 perpendicular JRs as before. Tie, cut & hide the tail or sew it in. Note : The 2 buds have been made in one pass. But looking back, it is better to make them separately, each one starting from the bud end & moving down to the stem. Threads can be encapsulated later. Start with a twisted picot on a JC. The picots are closer initially, then the spacing increases slightly. Do as many as you want. When desired length is reached, stop & cut threads, leaving a tail of 2-3 inches. TIP : JC stem spirals around, so the twisted picots spiral around too, instead of sitting flat on a single plain. Another reason I used a JC chain, is to replicate in an abstract fashion, the fuzziness of a real poppy stem. Hook the green thread to any one picot at base of petal. Then make JC, encapsulating all the floral thread tails. After about 2 cms from base of flower, start attaching the buds’ stem & the leaf sprig. Make sure to encapsulate these from a little higher than the point at which the tails start; this will ensure free-standing stems that hold the buds & leaves. Also start cutting off tails, at different stages but After at least 1 inch of encapsulated main stem, for a tapering kind of stem. If an evenly thick stem is desired, then encapsulate all tails right till the end. Continue the stem further to desired length. Tie & cut. When encapsulated with all the tails, the stems remain stiff enough & no extra stiffening is required. It is also essential that a short part of the buds & leaf sprig stems be encapsulated within the main stem from the point where they are joined, so that they stay erect & in place without any support. NOTE : Each element holds it's shape. However, in case thread specifications demand, one can add an extra/auxiliary thread for encapsulation of stems. Black centre : picots are ~ ½ cm long each, with slight variation if desired. Buds & Stem : 1st pair : 1”x 1”, on a 4”/ 1½’ long stem. 2nd pair : >1”x 1”, on a 5½”/ 2’ long stem. Leaf Sprig : Twisted picots vary between 2½”-3”/ ~1’-1’+ in length, along a 3½”/ 1½’ long stem. The total length from tip to base, comes to about 6”/ 2½’ . Main Stem : <5”/ <2½’ long, from base of flower to end. One can add a calyx at base of flower. A set of long twisted picots, joined to the free picots at base of flower, might look good. It will also make the flower “complete” in case one does not want to follow up with a stem, etc. Once the sepals are in place, start with encapsulation for stem. A potential ROSE ?! 2 layers of petals. Sept 5th, Teachers' Day (India). and Helen Walters' Poppy Ice Drop adaptation here.